What are social minds? Two heads are better than one and this blog is curated jointly by Chris Frith and Uta Frith. Much of our brain is dedicated to our complex social lives. Getting old and older with the 70th Birthday milestone already in the distant past, Chris and I are becoming only more intrigued with our social abilities and disabilities. We have both studied conditions, which are marked by deep social failure. I have studied autism over a lifetime and Chris has studied schizophrenia for just as long. We have gained insights that has given us the impetus to look for a biological basis of social interactions. And we first wrote about this in 1999. There were some more papers since then, which we will reflect on in later posts. Eventually there will be a book called “What makes us social”. We are very excited to be part of a team that is producing a graphic non-fiction work, called “Two Heads”. The project is directed by our son Alex Frith. We worked with him before on one of his science books for children, See Inside your Head. The artist is Daniel Locke. We write about these two projects in their respective sections and will give updates from time to time. We are also writing posts for our existing blog about things that catch our interest and some of the posts are contributed by friends and colleagues. The first posts were written between February and June 2014, when we were in Budapest, Uta as a Fellow of the CEU Institute for Advanced Study, and Chris as Visiting Professor at the CEU Department of Cognitive Science. Since then there have been irregular posts on a range of topics from Markov blankets to Diversity, and some personal reminiscences. The portrait was painted by Emma Wesley in 2007. 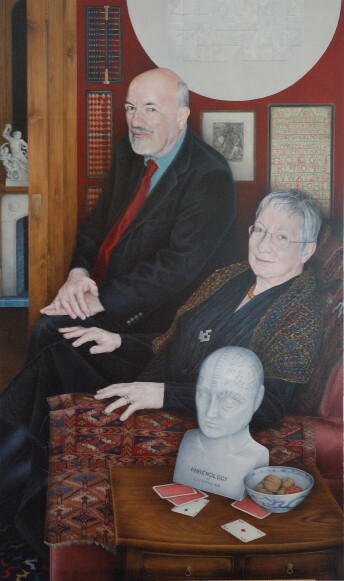 The picture has been exhibited at the National Portrait Gallery and in the Royal Society. If you are wondering about the objects in the painting, they are all carefully selected by Emma to tell about our interests and passions and our life together.